It's too late for this year (well, maybe you can still pull it off on the West Coast) but put this in your calendar for next year. And the good news is that you can pull it off with a stop at a drug store on the way into work. Start with packs of the cheesiest kids' Valentines possible—ones with stickers are good. Depending on what you go for you can get 30 for $3. Usually I avoid pop culture and go for ones like "animals" or "skateboarders" or "Fuzzy Art", but this year Twilight was too good to pass up putting in the mix. Get a reasonable-quality individually wrapped candy. This year I went with Ferrero Rocher, but if you do something like that be sure to get a nut-free alternative. Foil-wrapped hearts or Hersey's Kisses are fine too, if you're on a budget or have a huge office. Sign the From field. If your hand is up to it, in the To field put "an awesome coworker" or something, but you can just leave it blank. I try to avoid any hint of personalization that might make giving a valentine to a coworker awkward. 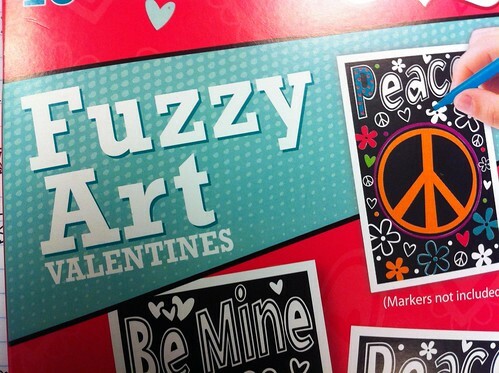 The vibe I'm going for is "grade school and everyone in class gets a valentine". It helps to not be creepy. Don't be creepy. Walk around the office and everyone gets a card and a candy. Instant office hero. Am I not scared that by giving away my secret everyone will do it? No, I am not, an office full of heroes would be fine. And besides maybe then I'll get some candy in return.